Roger David Kornberg (born (1947-04-24)April 24, 1947) is an American biochemist and professor of structural biology at Stanford University School of Medicine. 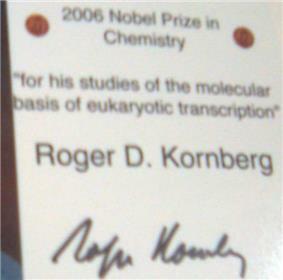 Kornberg was awarded the Nobel Prize in Chemistry in 2006 for his studies of the process by which genetic information from DNA is copied to RNA, "the molecular basis of eukaryotic transcription." "Kornberg" was born in St. Louis, Missouri, the eldest of three sons of biochemist Arthur Kornberg, who won the Nobel Prize, and Sylvy Ruth (Levy) who was also a biochemist. He earned his bachelor's degree in chemistry from Harvard University in 1967 and his Ph.D. in chemical physics from Stanford in 1972 supervised by Harden M. McConnell. Kornberg became a postdoctoral research fellow at the Laboratory of Molecular Biology in Cambridge, England and then an Assistant Professor of Biological Chemistry at Harvard Medical School in 1976, before moving to his present position as Professor of Structural Biology at Stanford Medical School in 1978. His closest collaborator has been his wife, Professor Yahli Lorch. All organisms are controlled by their genes, which are coded by DNA, which is copied to RNA, which creates proteins, which are sequences of amino acids. DNA resides in the nucleus. When a cell expresses a gene, it copies (transcribes) that gene's DNA sequence onto a messenger RNA (mRNA) sequence. mRNA is transported out of the nucleus to ribosomes. The ribosomes read the mRNA and translate the code into the right amino acid sequence to make that gene's protein. The DNA is transcribed to mRNA by an enzyme, RNA polymerase II, with the help of many other proteins. Using yeast, Kornberg identified the role of RNA polymerase II and other proteins in transcribing DNA, and he created three-dimensional images of the protein cluster using X-ray crystallography. Polymerase II is used by all organisms with nuclei, including humans, to transcribe DNA. Kornberg and his research group have made several fundamental discoveries concerning the mechanisms and regulation of eukaryotic transcription. While a graduate student working with Harden McConnell at Stanford in the late 1960s, he discovered the "flip-flop" and lateral diffusion of phospholipids in bilayer membranes. While a postdoctoral fellow working with Aaron Klug and Francis Crick at the MRC in the 1970s, Kornberg discovered the nucleosome as the basic protein complex packaging chromosomal DNA in the nucleus of eukaryotic cells (chromosomal DNA is often termed "Chromatin" when it is bound to proteins in this manner, reflecting Walther Flemming's discovery that certain structures within the cell nucleus would absorb dyes and become visible under a microscope). Within the nucleosome, Kornberg found that roughly 200 bp of DNA are wrapped around an octamer of histone proteins. Kornberg's research group at Stanford later succeeded in the development of a faithful transcription system from baker's yeast, a simple unicellular eukaryote, which they then used to isolate in a purified form all of the several dozen proteins required for the transcription process. Through the work of Kornberg and others, it has become clear that these protein components are remarkably conserved across the full spectrum of eukaryotes, from yeast to human cells. At the same time as Kornberg was pursuing these biochemical studies of the transcription process, he devoted two decades to the development of methods to visualize the atomic structure of RNA polymerase and its associated protein components. Initially, Kornberg took advantage of expertise with lipid membranes gained from his graduate studies to devise a technique for the formation of two-dimensional protein crystals on lipid bilayers. These 2D crystals could then be analyzed using electron microscopy to derive low-resolution images of the protein's structure. Eventually, Kornberg was able to use X-ray crystallography to solve the 3-dimensional structure of RNA polymerase at atomic resolution. He has recently extended these studies to obtain structural images of RNA polymerase associated with accessory proteins. Through these studies, Kornberg has created an actual picture of how transcription works at a molecular level. According to the Nobel Prize committee, "the truly revolutionary aspect of the picture Kornberg has created is that it captures the process of transcription in full flow. What we see is an RNA-strand being constructed, and hence the exact positions of the DNA, polymerase and RNA during this process." Kornberg has served on the Scientific Advisory Boards of the following companies: Cocrystal Discovery, Inc (Chairman), ChromaDex Corporation (Chairman), StemRad, Ltd, Oplon Ltd (Chairman), and Pacific Biosciences. Kornberg has also been a director for the following companies: OphthaliX Inc., Protalix BioTherapeutics, Can-Fite BioPharma, Ltd and Teva Pharmaceutical Industries, Ltd.
Kornberg has two younger brothers: Thomas B. Kornberg (b. 1948) a biochemist who was the first person to purify and characterise DNA polymerase II and DNA polymerase III and Kenneth Andrew Kornberg (b. 1950) an architect specializing in the design of biomedical and biotechnology laboratories and buildings. ^ a b Kornberg, Roger David (1972). The Diffusion of Phospholipids in Membranes (PhD thesis). Stanford University. ^ "Roger Kornberg wins the 2006 Nobel Prize in Chemistry". 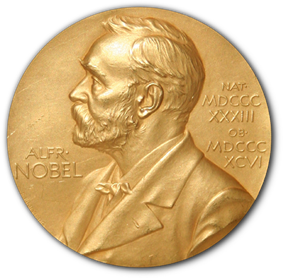 ^ "Press release: The Nobel Prize in Chemistry 2006". ^ N, Kresge; Al., Et (2009). "The Decade-long Pursuit of a Reconstituted Yeast Transcription System: the Work of Roger D. Kornberg". ^ Kornberg, R. D. (1974). "Chromatin Structure: A Repeating Unit of Histones and DNA". Science 184 (4139): 868–871. ^ Kelleher, Raymond J.; Flanagan, Peter M.; Kornberg, Roger D. (1990). "A novel mediator between activator proteins and the RNA polymerase II transcription apparatus". Cell 61 (7): 1209–1215. ^ Cramer, P. (2001). "Structural Basis of Transcription: RNA Polymerase II at 2.8 Angstrom Resolution". Science 292 (5523): 1863–1876. ^ Gnatt, A. L. (2001). "Structural Basis of Transcription: An RNA Polymerase II Elongation Complex at 3.3 A Resolution". Science 292 (5523): 1876–1882. ^ Bushnell, D. A. (2004). "Structural Basis of Transcription: An RNA Polymerase II-TFIIB Cocrystal at 4.5 Angstroms". Science 303 (5660): 983–988. ^ Hartl, Franz-Ulrich (2001). "Roger D. Kornberg Felix Hoppe-Seyler Lecturer 2001". Biological Chemistry 382 (8). ^ "The 2005 Alfred P. Sloan, Jr. Laureate". Archived from the original on 2006-10-19. Retrieved 2006-10-04.